In June, 1999, I returned to Ekaterinburg with the hope that we would be successful in finding the missing remains of the Romanov children. The team consisted of geologist, Dr. Alexander Avdonin, Dr. Sergey Nikitin, the Medical Examiner from the City of Moscow and Kremlin archeologist, Dr. Tatiana Panova. We had volunteers to help us with the labor. We started by using General Deterikhs' map to try to pinpoint the location of the second bonfire. First we measured the distance and bearings from the center of the Open Mine, and we then marked the area that we wanted to dig. Avdonin had read that Investigator Sokolov had found traces of yet a third bonfire, but had no time to uncover it because the Bolshevik Army was approaching. According to my grandmother, Anna Sergeyevna Rozanov- Naryshkin, when Sokolov first arrived at the Four Brothers Open mine, he saw that the platform next to the Open Pit was covered with a fresh bed of clay near where the sites of two bonfires. After the Reds left the area, the locals had a chance to investigate what the Reds had done. They found many precious stones, gold, crosses, icons etc. belonging to the Russian Imperial Family which they turned over to the different investigators; initially it was Nametkin, then Sergeyev and finally Sokolov. Dr. Avdonin wanted to dig up the platform as far down as possible to find traces of the third bonfire and, perhaps, any items that might have been left by the Reds. Many more items were found during our June expedition, than during our first search in 1998, but all were similar to what Sokolov had found in 1919. Nikitin and I found the site of the second bon fire. We saw that this bonfire site had been thoroughly excavated and other than coal, nothing else was found. At the same time that Nikitin and I were digging around the second bon fire site, Avdonin and Kremlin Archeologist, Tatiana Panova were digging near the Open Mine shaft. At a depth of approximately 20 centimeters, Avdonin found the third bon fire site. This site covered a much larger area than the other two fire sites. About fifty bone fragments were found, but these were later identified to be animal bones. From archival research, we had learned that the Bolsheviks had tried to burn four of the corpses, but were unsuccessful. Finding this new bon fire site was an integral step to furthering our investigation. The bones shown above were found at the Four Brothers mine area site. We believe that the bones found by Investigator Sokolov were similar to the ones above as they were animal bones and not human. Once the Russian Orthodox Church Abroad allows investigators to examine the bones that are in the Sokolov Box, it will confirm whether the bones Sokolov had found were either human or animal in origin. Sokolov had to be evacuated from Ekaterinburg, due to the Red Army advance, without finding the Imperial remains. He concluded that most likely all the remains were cremated. We feel that his findings were insufficient to arrive at such a conclusion. Sokolov did find bone fragments and these specimens they believed were indeed animal bones, but only further examination by experts was required to confirm that belief. He found no traces of human remains other than the Empress' ring finger that had been cut off by the Reds and discarded in the Mine Shaft. I left Ekaterinburg happy that we had found the second bonfire described by Sokolov and Deterikhs. The search continued without my presence. The third bonfire was very large and apparently had been very hot. We found the melted neck of a glass wine bottle. This was the fire where the Reds tried to burn four bodies. Traces of that fire were clearly visible in the clay. Signs that the fire was swept towards the mine shaft were also very clear. Again, no human remains were found. All the soil was put back as we found it, and all the grass was rolled back where it originally grew. We searched every possible area following Sokolov's tracks, we continued his work, but, like Sokolov, came out empty handed. The search must continue, but not at this location. The Russian Orthodox Church has now taken over the Four Brother Mine area and has built a beautiful monastery made up of seven Churches. We no longer have access to this area as the Church has proclaimed it to be a Holy Site. We are glad to have had the chance to thoroughly search it and that we were able to continue Investigator Sokolov's work. We did not find the remains of the missing Romanov children at Four Brothers. Initially we believed that when the truck carrying the murdered remains of the Russian Imperial Family and their faithful servants, got stuck in the mud at Pig's Meadow, there would not have been enough time to completely burn two corpses. The corpses must have been burned and disposed of at Four Brothers. 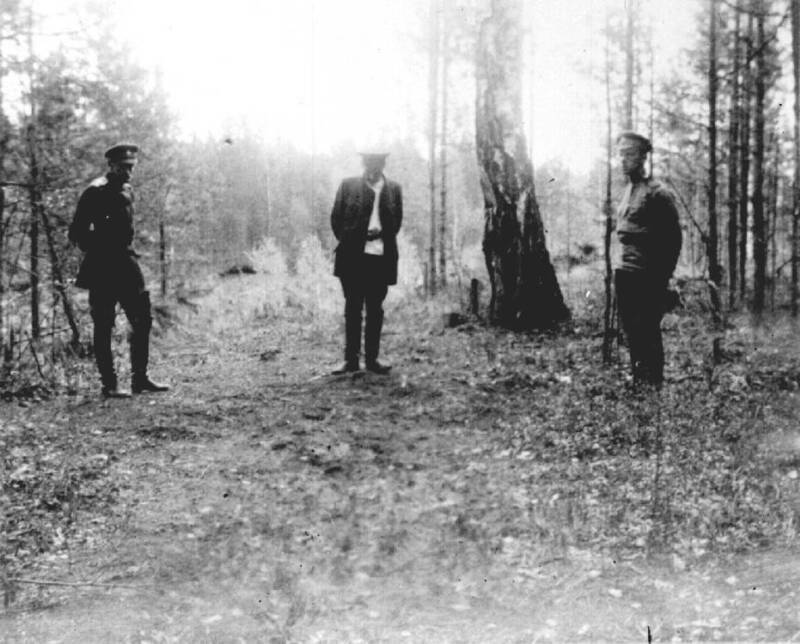 Although the Yurovsky Papers correctly pointed out the location of the main grave on the Koptiaki Road at Pig's Meadow, and stated that the two other remains were buried separately but nearby, we had to, first, complete the search at Four Brothers and exclude it. Having completed our search at Four Brothers, our next search was to be at the Pig's Meadow.